April 2000....Things do seem to go in cycles. 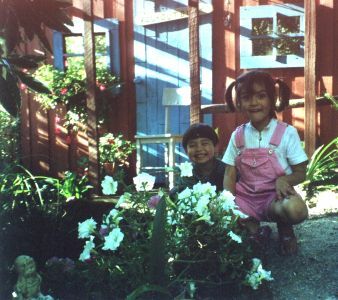 Now that the grandkids are school age there was no longer a great worry about a large pond of water in the garden. 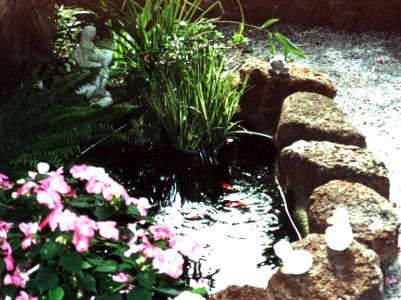 Thus the original garden pond, that had resided for several years in my Mother's back garden, was repatriated back to Lawson Avenue (complete with a number of very well fed gold fish) but to a new position opposite the Folly at the back of the garden. Situated under a large tree, it is a shady and fairly dry position but well clear of the main foot paths. The plantings of ferns, hostas, babystears and clivia will need a lot of attention until the autumn rains finally arrive. 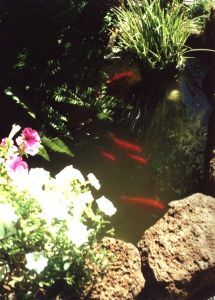 The gold fish soon settled down to enjoy their sunny new home.